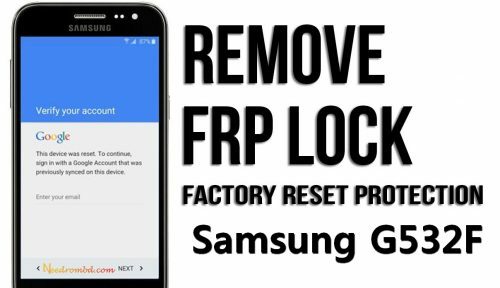 Samsung SM G532F Remove FRP Account Process and how to remove guideline. On this page we show you how to remove Samsung SM G532F FRP or google account with Z3X Pro and Odin Downloader. you can also download combination file,firmware and frp remove tools. This method works on Z3X and odin flash tool. so lets start remove Samsung SM G532F Remove FRP . Step 1: Run Z3x Pro Tools>select Model> Go to download section and download any combination file. Step 2: Odin User download this file from here. Step 3: After download turn off your phone and go to Download mode. Step 4: Now flash this combination file first . Step 5: After flash procress phone will restart. Step 6: Now to to to phone setting and tab 7 times on build Number to turn on developer mode. Step 7: On developer mode Turn ON Debigging On. Step 8: Now download Samsung Samsung SM G532F File Form Here. Step 9: After download again Enter on Download mode. Step 10: To start Flash process Select Flash file and Uncheck “boot.img” form section PDA. Step 11: Now click on Flash button and Z3X Start Flashing.after flash Phone will Restarted. Step 12: Disconnect Phone Connect it again to USb For ADB Drivers.